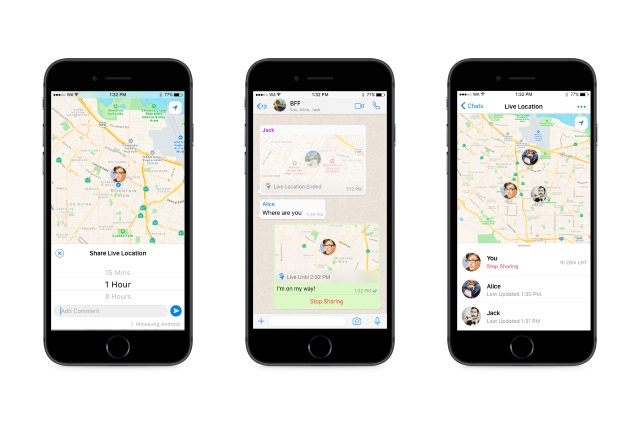 Following the lead of Facebook Messenger and iMessage, WhatsApp is gaining a location sharing feature. It's something that was tested earlier in the year, and now it has been deemed ready for prime time. The "Share Live Location" feature can be enabled for a fixed period of time -- you can choose between 15 minutes, an hour, or 8 hours -- or you can manually switch it on and off as required. When enabled, WhatsApp will report your location to your contacts. WhatsApp previously made it possible to share your location, but this was only on a static map. Real-time tracking allows for real-time monitoring -- something which is sure to set privacy alarm bells ringing. But WhatsApp says the feature is designed to be used to let others know that you are OK, and to allow them to see that you have made it to your destination. There will, of course, be concerns that the feature could be enabled without someone's knowledge to track where they go. We're rolling out a new feature that allows you to share your location in real-time with family or friends. Whether you're meeting up with friends, letting loved ones know you're safe, or sharing your commute, Live Location is a simple and secure way to let people know where you are. This end-to-end encrypted feature lets you control who you share with and for how long. You can choose to stop sharing at any time or let the Live Location timer simply expire. The feature is making its way to Android as well as iOS, and WhatsApp says the rollout will take a few weeks to complete.